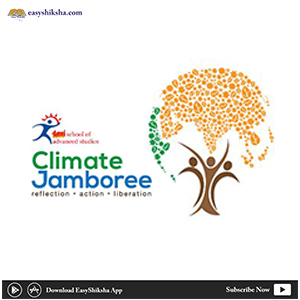 With a mission to empower youth to take ownership of creating a sustainable future for themselves, Dalmia Cement and the TERI School of Advanced Studies (TERI SAS) have jointly launched a programme of engagement – the ‘Climate Jamboree’. The Programme aims to help youth engage in different streams of study, and aspiring for diverse careers, to recognize both the common as well as unique opportunities they have to influence more desirable outcomes. A medley of diverse ‘lead-up’ events exposing youth to the diversity of sustainability solutions, culminating in a Finale that would stitch together the various elements in an engaging manner, the Climate Jamboree aims to carry the voice of youth to decision-makers and opinion leaders. With activities designed for students/young professionals of management, law, urban studies, natural and social sciences, media and communications, among many others, this programme also hopes to create communities of action in different geographies networked together for maximum impact. Open to youth across the country and beyond, most of the lead-up events would be undertaken on an online mode but the Finale, scheduled between November 1 – 3, 2018 at the Thyagaraj Stadium in New Delhi, aims to engage well over10,000 youth and other relevant stakeholders to ideate, learn, innovate and collaborate on sustainability solutions. At the Finale, Youth will have a chance to interact with national and global experts and express their concerns/ideas via interactive workshops, performing arts, exhibitions, technical sessions, live demonstrations, competitions, exciting innovations and many more outlets. “Our vision is to harness the energy and imagination of youth to initiate a movement towards a more climate-friendly and sustainable future. Combining the knowledge of experts with the practicalities of on-the-ground actors and the enthusiasm of youth, the Climate Jamboree also hopes to find reflection in the responses of society at large,” said Dr. Leena Srivastava, Vice Chancellor, TERI School of Advanced Studies. “Dalmia Cement, with the lowest carbon footprint in the cement world, has always recognized its responsibilities towards creating a fair and sustainable society. Today, we are proud to announce our partnership with the TERI School of Advanced Studies for creating the capacity amongst India’s youth to design a sustainable future, and to facilitate the creation of this transformative movement,” said Mr. Mahendra Singhi, Group CEO, Dalmia Cement Bharat Ltd. The TERI School of Advanced Studies is a research university focused on sustainability studies. With 14 Masters programmes based on sustainability themes ranging from renewable energy, water, environment, climate change, sustainable development and more, in an interdisciplinary manner, it is uniquely placed in the country and beyond. The university, which falls under the Category II autonomy status for Deemed-to-be universities, also has a robust research programme comprising nearly 200 Ph.D. students and strong faculty research too. Dalmia Cement (Bharat) Limited (DCBL), a subsidiary of Dalmia Bharat Limited (BSE Code: 533309|NSE Symbol: DALMIABHA and listed in MSE), is a leading player in cement manufacturing since 1939. It has been globally ranked no. 1 by CDP (formerly Carbon Disclosure Project). It is one of the largest and most diverse cement companies in India and is the world's greenest cement company. With a growing capacity, currently, at 26 MnT, it is also the fourth largest manufacturing capacity in the country. Spread across nine states and 12 manufacturing units, the company is also the category leader in super-specialty cement used for oil wells, railway sleepers and airstrips and is the country's largest producer of slag cement. It has the lowest carbon footprint in the global cement industry.